I know about Openraster (.ora), but I lose channels and masks. My problem is that I use different tools, mostly Krita and Photoshop. Krita does a great job opening .xcf files and saving them as (reasonable) .psd files. Gimp is absolutely awful at .psd. My problem now is that with Gimp 2.9 the .xcf files from Gimp are not even compatible with Krita. Better yet, is there a way to edit the .xcf files so that Krita thinks is created by version 2.8? I tried opening an .xcf file with a test editor and it freaked out. The PSD plug-in now supports a wider range of blending modes for layers, at both importing and exporting: Linear Burn, Linear Light, Vivid Light, Pin Light, and Hard Mix blending modes. It also finally supports exporting layer groups and reads/writes the Pass Through mode in those. Additionally, GIMP now imports and exports color tags from/to PSD files. I spoke too soon. I'm now using 2.9.7 and . . . OMG it is awesome, at least I think so. I need to test it, but still would like to know if anyone here is aware of a good format. I ran some tests when exporting as .psd. I think .psd will be my new standard file type with Gimp 2.9. 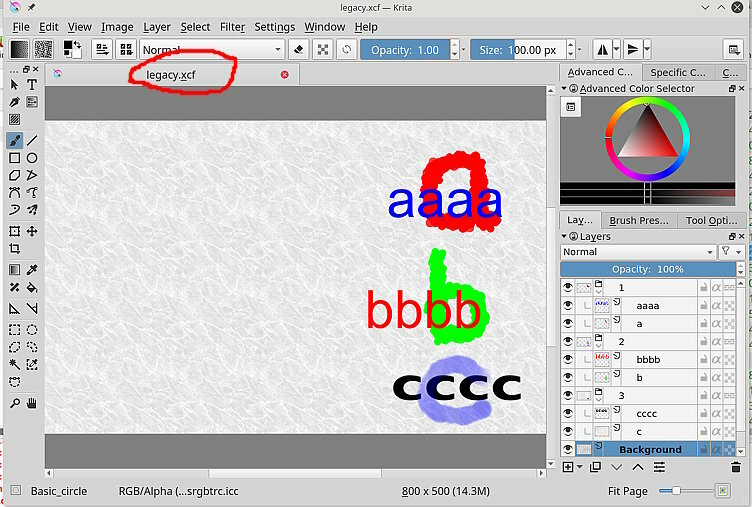 Gimp 2.8 can open them, although I don't know what will happen with the new layer modes . . . It appears to just translate them into the closest old modes. Modes like 'pin light' just translate into 'normal' for Gimp 2.8. That's fine with me, because it is better than NOT OPENING AT ALL with the new .xcf format in Gimp 2.8. Unfortunately we can't have masks on groups, but at least we can have groups now! Wow this is about as happy a discovery I've made in a long time with Gimp. And it looks like It does save channels (along with color channels) in the .psd. Tested in Gimp 2.8 and Photoshop, although I had an issue with Krita. Sometimes layers tend to lock themselves when loading into PS. Very, very happy with this! It is a good point you bring up there. Might help others. Used to be Gimp 2.9.3 (& earlier 2.9.5) defaulted to a Gimp 2.8 Save mode with a warning for non-compatibility. For compatibility everything has to be set to Legacy mode. 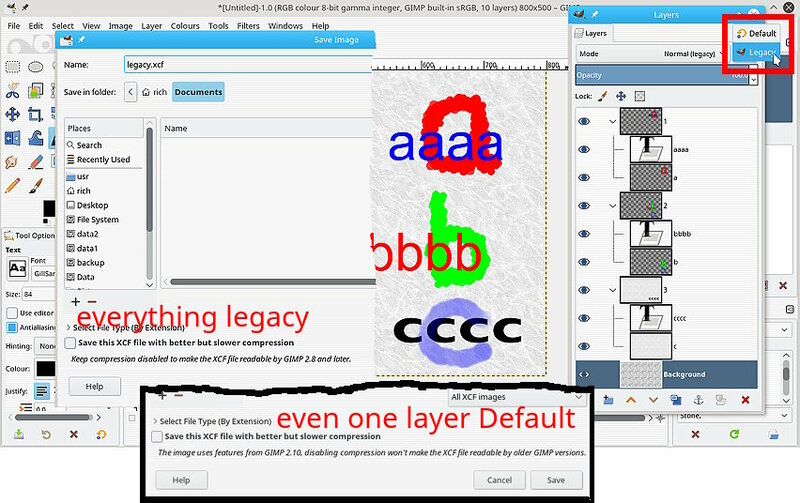 Even a single Default layer will force the Save to Gimp 2.9 format. Not too easy to determine layer modes without visiting each layer. Maybe a 'wish' to add an indicator required. Open a backward compatible xcf file in Krita? https://i.imgur.com/uRpMMFm.jpg I use it so little that I doubt if I can tell any difference between xcf/psd, but a valid point about the improved psd format. Well, it pains me slightly to recommend .psd as the default multi-layer file. The problem is that with Gimp 2.9, only Gimp 2.9 can open the .xcf files created by it. But a .psd exported from Gimp 2.9 can be opened by just about anything that can open a .psd. I can work in the newest Gimp and not worry so much. Krita, PS, and Gimp 2.8 can at least open them. Sure, I may lose a few features, but the layers, masks, groups, (and sometimes channels) are still there. Often the layer modes are close enough. 2 issues (among others) stand out: It looks like the .psd goes to 8 bit for export and the .psd is larger than .xcf. Not a big deal for me if I run my filters at 32 bit and then it goes to 8 for export. And I will happily pay he price for the larger files. You found a system that suits you. Quote: The problem is that with Gimp 2.9, only Gimp 2.9 can open the .xcf files created by it. Is not quite true, but you do have to take care to use Legacy Layer Modes. (09-07-2017, 12:39 PM)rich2005 Wrote: You found a system that suits you. Actually it's worse than that. As 2.9 is a constantly evolving beast, there is no guarantee that any particular version will be able to read an .xcf saved using a previous version, and I don't just mean 2.9.6 can't read 2.9.4. 2.9.7 built using the latest git commit today won't necessarily load .xcfs saved using 2.9.7 built using a git commit from yesterday. Until stability is reached at 2.10.x everything is in limbo. Current time: 04-20-2019, 06:56 AM Powered By MyBB, © 2002-2019 MyBB Group.